The course of modern imaging has been forged by the talent and ingenuity of working professionals, but also by the introduction of a few cameras so innovative and forward-thinking, they redefined what's possible. The Nikon D4 has been such a camera. 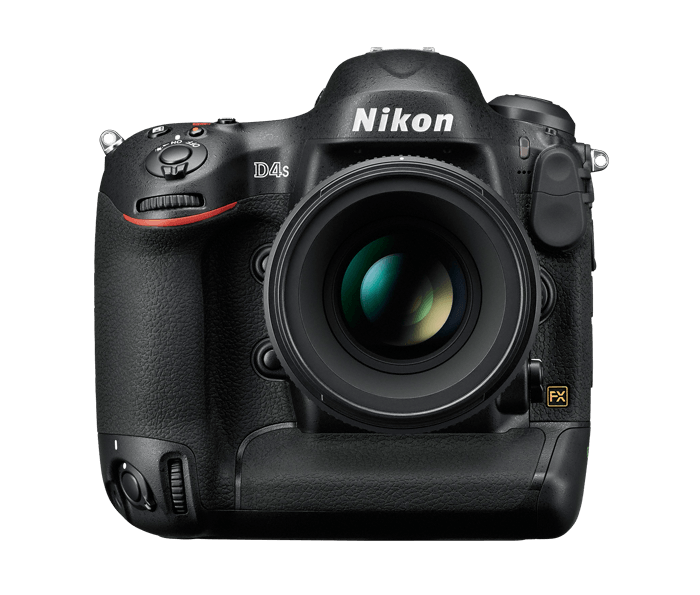 And now D4S proves that a great thing really can get better, with remarkable enhancements throughout the entire workflow, dazzling new levels of speed, performance, ISO sensitivity and, of course, the superior image quality of a Nikon camera. How do you make a revolutionary camera better? Improve its speed, precision and efficiency without sacrificing the features that make it exceptional. D4S builds on the success of D4 with 30% faster image processing and substantial energy savings—capture up to 3,020* stills on a single charge—an extended standard ISO range (100-25,600) with enhanced noise reduction, and improved tonal range and smoother gradations. Shoot 11 fps for approx. 200 shots at full resolution with AE and AF functionality. For faster initial subject capture, use five AF sensors as a single focus point with the new Group Area AF setting. Transfer files faster than the D4 with new 1000 Base-T (Gigabit) wired LAN, and increase that speed further by shooting a new smaller RAW SIZE S format. Perform at your peak—D4S will keep up. Like its predecessor, the D4, the D4S delivers a level of image quality that elevates the power of any story. An improved 16.2MP FX-format CMOS image sensor is paired with Nikon's spectacular new image-processing engine, EXPEED 4, for truly phenomenal speed and performance in the field. The combination achieves outstanding ISO sensitivity, faithful, vibrant color, natural depth, subtle nuanced tones from pitch black to snow white and smoother gradations in both stills and videos. Nikon's proven 51-point AF system and 3D Color Matrix metering III with a 91,000-pixel RGB sensor provide fast, accurate autofocus and metering. Enhanced Picture Control tone curves deliver more depth and clearer color rendition in "Standard" mode. For viewfinder shooting, a new custom setting lets you toggle Face Detection on and off as the situation requires for improved exposure bias around your subjects. You can even measure White Balance against any point in the frame. Photographers go where their assignments take them, and this often means working in the high-contrast glare of the midday sun, the low-light at dawn or the poorly illuminated interiors of a sporting venue. 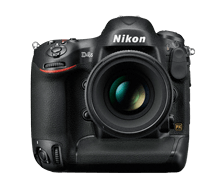 Nikon flagship D-SLRs have long been recognized by professionals for their clean performance at high ISO settings, and D4S takes that performance to the next level. With a specially designed 16.2MP FX-format CMOS image sensor engineered to collect more light and render higher image quality plus the power of EXPEED 4, you can shoot sharp photos from ISO 100 all the way up to 25,600. The ISO range can be extended to a mind-boggling ISO 409,600 equivalent at Hi 4 for overcoming the most challenging lighting conditions. Enjoy great flexibility in your approach to fulfilling challenging assignments. D4S is designed to keep you shooting wherever the story brings you, even after others have packed their bags for the day. Its increased ISO range means you'll be able to capture brilliant photos and videos in whatever light is available. Enjoy improved ergonomics and operability as well as flagship levels of durability and reliability—key for those who spend all day with a camera around their neck. Select from five image area modes while shooting stills in Live View: FX, DX, 1.5x, 5:4 and 1.2x. A new RAW SIZE S setting allows for shooting 12-bit uncompressed Nikon NEF files that are smaller and more easily manageable—speeding up the entire workflow. When you're racing a deadline at a major event, D4S can transfer images up to 10x faster than previously possible with its 1000 Base-T Ethernet. D4S is the camera for today's working pro. Nikon engineers worked closely with professionals to achieve optimal ergonomics with the D4, and D4S improves upon that design. The grip has been reshaped, making the camera easier to hold for a wider range of hand sizes and more comfortable during prolonged use. An anti-slip pattern has been added to the joy stick controls for superb fitting, and a larger card slot cover provides additional grip when shooting vertically or horizontally. Several custom settings have been added or improved, making D4S more intuitive to use, and like D4, most of the buttons on the rear are illuminated for easier adjustments in low-light situations. D4S is designed to go wherever your assignments takes you—even severe conditions. Its lightweight yet durable magnesium alloy body features careful weather sealing and has been optimized for resistance against dust, moisture and electromagnetic interference. Its shutter has been tested to 400,000 cycles, and an improved mirror balancer provides better visibility in the viewfinder during high-speed continuous shooting and reduced mirror vibration. Like the D4, its large optical viewfinder offers 100% frame coverage and approx. 0.7x magnification for bright, clear views of your frame. Optimized for high-resolution HD-SLRs, the EXPEED 4 image processing engine achieves a remarkable new level of speed, image quality and low-light capabilities in both stills and video recording. It's also exceptionally energy efficient, prolonging the camera's ability to endure extended assignments. It delivers faithful, well-saturated color, natural depth and subtle, nuanced tones from pitch black all the way to snow white. In dim lighting at high ISO settings, the camera's intelligent noise reduction lowers noise without degrading image sharpness. High-speed 16-bit image processing delivers smooth gradation with abundant tone and detail that can be applied to image integrity for a diverse range of uses. EXPEED 4 has been optimized for video as well, suppressing moiré, reducing false colors and minimizing "jaggies". Noise reduction technology specifically designed for video preserves clarity and sharp edges—even in low light. The strength of a camera is influenced by the quality of its peripheral components—lenses, flashes, accessories and software—and Nikon's imaging system is second to none. For over 80 years, legendary NIKKOR lenses have set the bar for quality in optics. Nikon's innovative i-TTL (intelligent Through The Lens) technology has revolutionized the accuracy of its Creative Lighting System, and D4S optimizes pre-flash data even further for improved performance. Nikon Software provides photographers with excellent tools for tethering, managing images, editing and post production work, and more; and a growing collection of accessories like the ME-1 External Stereo Microphone, WR-1 Wireless Remote Control, WR-R10 and WR-T10 controller and transmitter, the WT-5A Wireless Transmitter and so much more extend the capabilities of D4S in thrilling new ways.